In a mixer fitted with a paddle attachment cream together the butter and sugars. Beat on medium for 2 minutes. Scrape down the sides of the bowl . Increase speed to high and beat an additional 2 minutes. Scrape down the bowl. Add the eggs and beat on medium for 30 seconds. Add the vanilla and beat on high for 30 seconds. With mixer on low alternate adding the dry ingredients with the wet ingredients into the mixing bowl. Mix until just combined. Remove the bowl from the mixer and use a rubber spatula to finish mixing the batter, until smooth and thoroughly combined. Immediately pour the cake into the prepared pan, spreading evenly. Bake on the center rack of a preheated 325F oven. Bake for about 45 minutes or until a toothpick inserted comes out clean. Remove the cake from the oven and cool in the pan for 15 minutes at room temperature. Invert cake onto a plate or cake circle. Turn the cake upright and refrigerate until needed. Heat cream in a saucepan over medium-low heat, until hot(do not allow to boil or simmer). Combine sugar and lemon juice in a separate saucepan. Stir with a whisk to combine(the sugar will resemble moist sand). Caramelize the sugar for 4 to 5 minutes over medium high heat , stirring constantly with a whisk to break up any lumps. Remove the saucepan from the heat. Add the hot cream, one half at a time. Add the butter, on piece at a time, stirring to incorporate before adding the next piece. Cool in the refrigerator for 45 minutes before placing in the bowl of an electric mixer fitted with a paddle attachment. Beat on high for 2 minutes, until light(but not fluffy). Add the walnuts and stir to incorporate. Set aside for a few minutes. Heat brown sugar, heavy cream, 2 1-ounce pieces of butter, and ¼ tsp cream of tartar in a 3 quart saucepan over medium-high heat, stirring frequently while bringing the mixture to a boil. Allow the mixture to continue boiling while stirring constantly, for 2 minutes. Transfer the bubble hot mixture to a 3-quart stainless steel bowl and allow to stand at room temperature for 1 hour before proceeding. Place the cooled mixture int the bowl of an electric mixer fitted with a paddle. Beat on low for 30 seconds. Then beat on medium for 2 minutes, while adding the remaining 6 pieces of butter, one at a time, until incorporated. Scrape down the sides of the sides of the bowl. Increase the speed to high and beat for an additional 2 minutes. Scrape down the sides of the bowl and beat on high for an additional 1 minute until light and fully. Transfer 1 cup of icing to a pastry bag fitted with a large star tip, and place in the refrigerator until needed. Remove the cake from the fridge. Taking a serrated knife, split the cake horizontally. Spread butterscotch filing on the bottom layer of the cake, evenly spreading the filling to the edges. 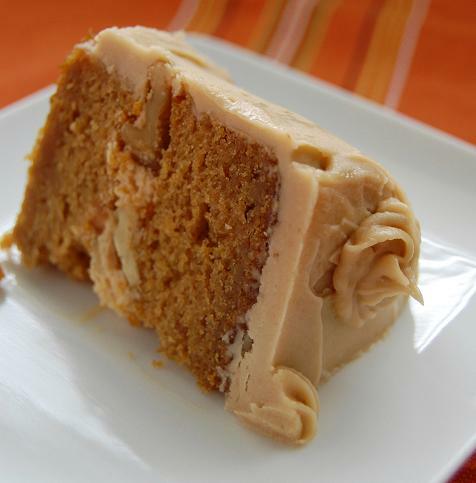 Place the pumpkin cake top layer on top of the butterscotch filling. Press gently but firmly to level the layers. Refrigerate the cake for 20 minutes. Remove the cake from the refrigerator and use a cake spatula to coat the top and sides of the cake with the icing. Pipe a circle of twenty brown sugar icing stars along the outside edge of the top of the cake. Refrigerate the cake for 30 minutes before cutting and serving.